Then we finished brushing teeth and hurried off to bed. I have recently become intrigued by the concept of name pronunciation. Different cultures and different regions pronounce words differently. We’ve accepted that people in the South pronounce pen and pin the same and that a lot of words sound very different if someone from, say, Boston says them. When it comes to names, though, are those differences acceptable? Or are you required to pronounce the name as the person it belongs to pronounces it? There is a boy on my son’s basketball team named Dashawn. I’m not sure of the spelling but after my son told me his name, I pronounced it “duh-shawn” with an emphasis, if any, on the second syllable. At a recent game, I sat near his mother, who called out his name “DAY-shawn” (with an emphasis on the first syllable). I found myself in a delimma. I can’t seem to pronounce it that way. Try as I might, I can’t seem to use the long A in the first syllable and put the emphasis on that syllable. At least, not without sounding like I’m trying to adopt a fake accent. But am I even expected to? Or is it just her accent? If I try to pronounce it that way, will she think I’m making fun of her rather than trying to honor the proper pronunciation of her son’s name? I didn’t worry about such things until recently. I thought dialect issues were just that. I say “law-yer”, you say “loy-yer” and we both know what we are saying and it doesn’t matter. Such dialect issues didn’t translate to names very often. At least, not that I ever noticed. And that’s when I heard the difference. He was pronouncing it “soy-yer”. That sounded weird to me, but my son was insistent. It didn’t feel right on my tongue but I kept trying. Eventually, I commented on it to Sawyer’s mother. I was surprised by the strong reaction. Both she and her son were extremely bothered by people “mispronouncing” his name. She said she had worked so hard to pick names that couldn’t be mispronounced and she was distressed that his was so regularly pronounced wrong. She sighed and said she knew. She’s a Yankee stuck in the South, surrounded by people who pronounce her son’s name wrong. All this time, I thought she was saying “Soy-yer” simply because of her accent and that I was not expected to mangle my pronunciation of that name to match. But I am. And now that I know, I do it. But what abount Dashawn? I have no idea. I guess I’ll have to ask his mom too. I suspect that either Dashawn doesn’t care or he’s too shy to say something, because if he had ever spoken up about it, my son would have immediately enforced the “proper” pronunciation. Interestingly, there are two common pronunciations of my own name, each more common in different regions of the world. I don’t particularly like the “other” one but I’ve grown used to it. Every once in awhile, people ask me my preference and I usually tell them that I don’t bother correcting people unless they butcher it beyond those two pronunciations. It’s an interesting dichotomy to me. On the one hand, it’s a bit like spelling. People can spell and pronounce their names however they want and other people can and will misspell and mispronounce them. However, spelling is black and white. No matter how strangly people spell it, there is one “acceptable” spelling for that person. Pronunciation, on the other hand, depends on accent and on how much people expect you to match theirs when you say their name. This might seem trivial to many of you. But sometimes, it’s the little things in life that capture my attention and hold it long enough for me to analyze at great length and then blather on about to whomever will listen. The inner workings of Hal’s mind continue to fascinate me. He paused for a minute, deep in thought. “What should they have named him?” I asked. The Alone Ranger is what he calls The Lone Ranger. He can’t seem to embrace that “Lone” is a word so apparently assumes we are all saying “Alone” and no amount of discussion has been successful at persuading him otherwise. “But there’s already a Lone Ranger in the world!” I protested. “Yes, but there’s also a real one. Remember? We saw him at the train show? He just doesn’t talk.” Ah, yes. That one. How could I forget? At no point in this discussion did it occur to him that his brother, father, and grandfather all share the same name. Nor that his sister was named after a great-aunt. I guess since that woman’s name is always said with “Aunt” in front of it, he deems it different. I think there are also two boys named Logan in his class. Also not a problem – he just adds their last names. But the boy at church and the big blue train are both called – by him – Thomas. And that’s a problem. Thomas’s mother was relieved when I told her the outcome. Her daughter has already picked up the permanent nickname “Watermelon” due to Hal’s inability to pronounce her name. “The Alone Ranger” would be quite the awkward mouthful. I’m not a PTA mom. Not anywhere close to it. No one would mistake me for one either. I don’t do parties and decorations and fundraisers and gift baskets for teachers. Really, in all the stereotypes you can imagine, wherever you’d place the dads is probably where you should place me. But I am very curious. Especially when it comes to my children and their interactions with their peers. So when Jane joined the Stardusters dance lessons, I wanted to see how she did and what it was like. The only parents allowed in during the dance, however, are the chaperones. And the only way you are allowed to chaperone is if you agree to help decorate for the dance. 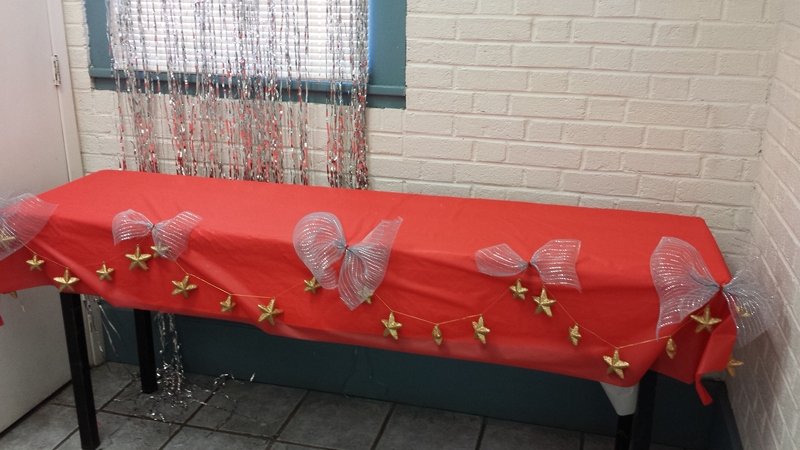 Only one parent has to show up for decorations in order to qualify both parents to attend the dance. Score! I thought. I have to work. My husband can help decorate and I can still attend that night. Perfect. But then the refrigerator died and he had to take care of it. I had already decided to help with decorating, again, just to see what it was like, but now I absolutely had to or we wouldn’t have a representative. The first thing I noticed was that I got there ten minutes early and there were already 10-12 people and a tremendous amount of decoration already up. The next thing I noticed was the incredible attention to detail. Lots of bows and stars and sparkly things. Eventually, after running Christmas lights and red tulle under all the chairs, I was given the task of decorating the little table in the hallway where the parting favors would sit. The red table cloth was thin plastic and showed through to the hideously damaged table top. I asked for and received a solid white tablecloth to put under it. But the seventh grade taskmaster mom declared that she didn’t like the white tablecloth showing. I put my thinking cap to work and used duct tape to secure the white tablecloth to the underside of the table so it didn’t show beyond the edges of the red cloth. I stared at the table and the two short strips of garland for a few minutes before wandering off to look for something else to do. One of the dads soon managed to step on a strand of lit Christmas lights, shattering one of the bulbs. Repair work! I’m on it! I spent the next little while trying out replacement bulbs and repairing the lights. I then helped hang up the glittery red wrapping paper on the wall for the photo booth, earning me red glitter on my forehead that was all the rage at work later. Every once in awhile, I’d wander back over to the table and the garland to see if anyone had taken over. No one had. Eventually, I used small pieces of tape to hold the garland in place in five locations around the edge of the table, letting the garland sag between each piece of tape. The eighth grade taskmaster paused at the table and scowled. Before she could speak, I hastily said, “I’m going to cover the tape with bows!” She responded with a curt “good” before walking on. I sighed in relief and then wondered exactly how I was going to make bows. I approached the seventh grade taskmaster, the kinder, gentler one, and asked if she knew how to make bows. I offered up some candidate silvery meshy stuff. I gathered some red pipe cleaners. She made a bow and we worked on wrapping it with the pipe cleaner before realizing that our get-up, while promising in appearance, was not going to cover my tape. The tape was carefully removed, slightly ripping the plastic table cloth. I used that hole to poke the ends of the pipe cleaner through and then used the tape to secure the pipe cleaner to the ugly white tablecloth beneath. I then tried my hand at her bow technique, making four more, none of which looked as good as the first. But the table earned a small nod of approval from the eighth grade taskmaster mom. Ugly tape girl had succeeded. I spent a lot of time looking at my hands this past week. I don’t know when they started looking so old. The skin is thin and the veins are always visible and if I extend my fingers out fully, there are thousands of tiny little wrinkles. The hands don’t match how I think of myself. I burst into tears when I saw it. Why? Because she had articulated some of that bad feeling I was having about my birthday. She doesn’t think of herself as old enough to be the mother of a forty year old. Where does time go? I wondered what the older woman would think of being called cute. I bet she still thinks of herself in much the same way she did when she was younger. Don’t get me wrong, she knows her body is old and doesn’t work as well anymore. But the woman inside – that woman is the same. But we don’t see her. We just see the old woman. And we call her cute. Which undermines everything she has to say. Whether we meant to do that or not. Maybe this is what I’ve been afraid of. That people will stop seeing me. That maybe they already have. Maybe I’m just the middle-aged white woman, which means whatever they’ve categorized that as in their head. I’m not a woman that has scaled mountains, ridden down small waterfalls, competed in collegiate co-ed roller hockey, built a kiln from scratch, given birth at home, preached sermons, won awards, created puzzles, stretched my horizons. A woman who married her high school sweetheart and made it work against all odds. For some reason, turning 40 scared me. I truly didn’t expect it to. And, really, if people are dismissing me as a middle-aged white woman, they’ve been dismissing me as something or the other my whole life. I can strongly remember being distrusted or belittled by bank officials and employers when I was in my late teens and early twenties. It really didn’t matter who I was. My age was all that mattered. I realized that was a bit of my concern, although on a much different scale, when I watched the older ladies at that meeting and I pondered getting older myself. I don’t want to be just the mom. Or just the old woman. I don’t want to be filed away as some stereotype. I want people to see me. To get to know me. And I’m afraid that people dismiss you more and more, the older you get. So I haven’t posted anything for five days now. For me, that’s a serious drought. I typically find something to say every day; worst case, I skip a day. It’s particularly humorous since I have 15 drafts waiting in various states, including one that I started at lunch 5 days ago and thought I’d wrap up that night. This happens from time to time. I get busy or I get withdrawn and don’t feel like writing. I’ve never figured out if I can’t find something to write about because nothing is happening or if it looks to me like nothing is happening because I don’t feel like writing. Sometimes, as I think has happened this time, I’m pondering BIG ISSUES but I’m simply too tired to express my thoughts cohesively. That takes so much more work than relating a funny conversation with my kids. My big issue right now is this. I recently turned 40 and I haven’t been able to figure out how I feel about it. In the days leading up to it, I felt like it ought to be a big deal and got depressed because I knew it wouldn’t be – it’d just be another day. And then I’d immediately think that it really isn’t a big deal and I didn’t want anyone to make it one. He responded simply that they already weren’t talking about me. He’s right. Stages of life are much more indicative than age. My daughter went to a friend’s birthday party the night before my birthday. The mom had 8 game cards for the video games at the venue but only 6 kids present. The birthday girl argued she should get the extras since it was her birthday. “But what if Jane’s mom and I want to use them?” her mother asked. “It’s my birthday!” she countered. “It’s my birthday too,” I said. “Yours isn’t until tomorrow,” Jane said. I laughed and waved it off. I didn’t actually feel like getting up from the couch. Besides, another mom, who turned 50 last year, sat down and we began to gossip, for lack of a more genteel term to describe our whispered discussions. And that leads me to what I think was my overriding thought as I tried to figure out how I feel. I don’t feel any different. I’m not any different. I’m the same person I’ve always been. Older, maybe wiser, maybe a tad more confident, maybe more responsible, but still me. And this woman in her fifties is still the same. And the people we were talking about. There isn’t some generic personality that goes with a given age. I think I had a problem with turning forty simply because it was an obvious milestone on my road to old age. I’ve had some fun joking about it though. Anything I could blame on age, I did. The morning of my birthday, my husband and I lay in bed, each playing a game on our phone. I dropped mine. On my face. Twice. My husband took his eyes off his game to look at me. I still don’t think I’ve processed it all. I will say that 40 plus a day was better than 40. And 40 plus two days was even better. And so on. So I think maybe I can adjust to this decade of life. I have some more thoughts that I’ll share soon. My thoughts have been so disjointed that I found it impossible to form into one cohesive post. Stay tuned… I’ll try not to keep you waiting another five days.